In choosing his courses and activities at Notre Dame, Micah Johnston ’06 followed his interests. That led him to major in history, focus on the history of France and its colonies, and study abroad in Angers, France. Finding a job after graduation was not part of that calculus. As commencement approached, the thought of spending a year in full-time service work appealed to him. It ended up being an important complement — and, in many ways, a capstone to his undergraduate education. The fall of his senior year, Johnston went to the Center for Social Concerns postgraduate service fair, where nonprofits working on a range of issues come to campus to recruit volunteers. There, he stopped at a booth for Little Brothers Friends of the Elderly, which serves socially isolated seniors in cities around the United States. Johnston’s host mother in Angers was elderly and spent hours sharing meals and playing cards with her friends, and coincidentally, the woman staffing the Little Brothers service fair booth that day was French. Something clicked. “After such a formative year in Angers, this French woman talking to me about spending time with elderly people — it made sense,” Johnston said. Johnston applied to spend the year after graduation volunteering for Little Brothers’ program in Chicago. 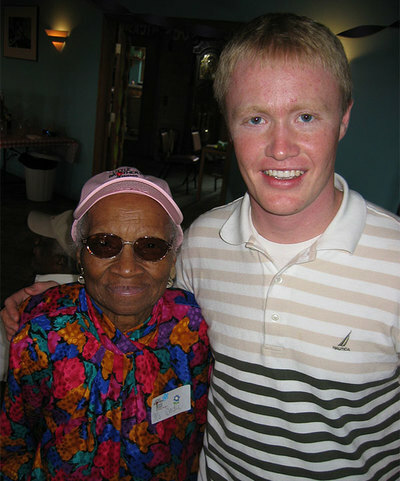 Johnston with one of the clients he regularly visited during his year of service with Little Brothers Friends of the Elderly. Founded in 1946 by a French nobleman, Little Brothers focuses on developing friendships with elderly people who do not regularly see friends or family. As a program assistant, Johnston had a caseload of 35 people primarily living on Chicago’s south and west sides. He spent his days visiting in their homes, listening to their stories, celebrating their birthdays, and “vacationing” with them at Little Brothers’ country home in Rochelle, Illinois. As he made his visits, Johnston glimpsed the social issues and inequalities intertwined with his clients’ individual lives. He learned how to have patience in building relationships with people of different backgrounds and life experiences — close connections, he found, take time to develop. Following his year of service, Johnston worked as an advisor to families navigating Chicago’s public housing system. Then, returning to his interest in European history, he earned a master’s degree in international affairs from American University. 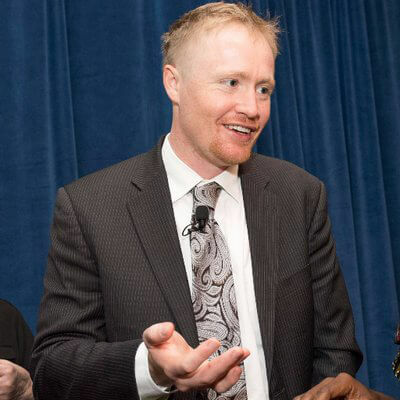 He’s now a senior program officer at the international development organization IREX in Washington, D.C., administering a program that supports young African leaders and offers professional development in the United States and African countries. Though the young leaders Johnston works with now are different from the seniors he worked with in Chicago, he sees similarities in the kinds of support he’s equipped to provide. 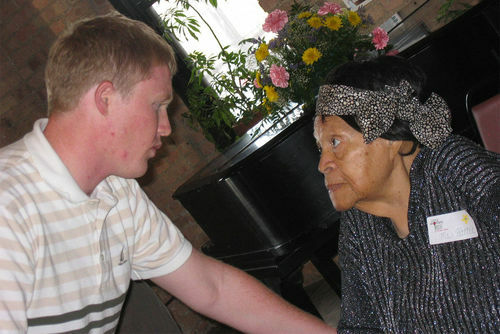 Johnston said he’s carried his experiences volunteering for Little Brothers through his career and personal life — from strong black women who suffered segregation and racial oppression who taught him to overcome differences with sincere friendship to the unforgettable kindness and wisdom of a 95-year-old widower who helped him value his deeper gifts and qualities that will never show up on a resume. Originally published by Emily McConville at al.nd.edu on September 19, 2018.